Anthony Rizzo and Hector Rendon celebrate the Cubs’ 7-6 win over St. Louis Friday night. 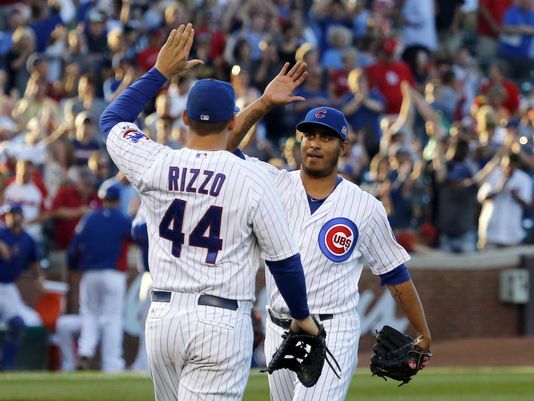 The Chicago Cubs were able to battle out a 7-6 win in a back-and-forth game against their rival Cardinals Friday night, but there hasn’t been a whole lot to cheer about since the All-Star break for the North Siders, a 6-3 loss to the Cards Saturday afternoon helping prove that much. Chicago returned from the break facing a total six games against the Diamondbacks and Padres, with three in Arizona and home for three to host San Diego. Though those two NL West bottom-feeders have a combined record of 90-115, the Cubs still managed to grab just one victory along the way. If you take away the Cubs’ lone 6-0 victory in the opener against San Diego, they were outscored 38-15 over the course of just five games. Oh, and by the way, these two clubs aren’t exactly offensive juggernauts, either — San Diego averages 3.11 runs per game and Arizona just under 4 per game, ranking them 30th and 16th in the league, respectively. What I’m trying to point out is that there are struggles, real struggles and there’s the Cubs and where they are at right now — somewhere far beneath those two. Perhaps the lone bright spot for the team right now has been the emergence of Anthony Rizzo, who has been on a complete tear in the month of July, hitting for a .308 batting average while knocking out eight home runs, scoring 18 times and driving in 11 runs. Rizzo even stole a base in two attempts. For his career, like nearly every left-handed hitter on planet Earth, Rizzo has performed better facing right-handed pitching, his career batting average against left-handed pitching is a lowly .221, while that same number against right-handers is a respectable .262. For whatever reason this season, Rizzo has been clubbing left-handed pitchers to the tune of a .313 average in 116 plate appearances and eight home runs. That’s an incredibly significant statistical jump. Is that large of a jump sustainable? Probably not, but it’s serious progression and if I have to try and pinpoint one thing that has allowed Rizzo to more comfortably face left-handers, it is his shortened bat stroke and his improved ability to pull his hands in and get around in pitches on the inner-half of the plate. Another stat that popped in Rizzo’s splits is his average from at-bats in which his contact with the ball was considered a line drive. Sure, this number is generally the highest of any hitters when looking at the three categories — ground balls, line drives, fly balls — but Rizzo’s .703 batting average on liners is still noteworthy, as in 65 plate appearances, Rizzo has managed 45 hits. Oh, and on 3-1 counts this season he’s hitting .407 and has produced five of his 25 home runs. Not a bad figure either for the slugger who’s starting to show us what he is truly capable of. 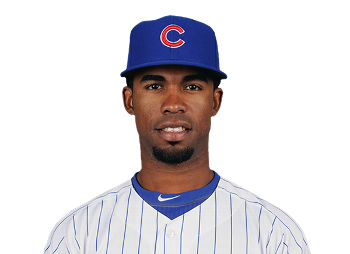 Though I don’t always I agree with the call-ups and DFAs of this club, I think calling up Arismendy Alcantara was the right move for the Cubs and his professional development. Alcantara is a top prospect in their farm system and he has all the tools to have a bright future ahead of him. In 366 Triple A plate appearances this season, “Mendy” hit for a .307 average while swiping 21 bases and 10 home runs. Prospects with that combination of speed, power and defensive ability is scary, and Alacantara is just 22 years old. As the likely second basemen of the “future” for the Cubs, its nice to see him getting tests at the major league level pitching. He’s faired pretty well thus far at the top level, too, I would say, flashing the leather a few times in the field and he has already gone deep twice in 12 games. It would be hard to say Alcantara is a step up defensively from Gold Glove winner Darwin Barney, but much more than Barney ever has he fits into Theo Epstein’s mold of what the competitive Cubs of the next few seasons should look like.